Pulmonary outcome measures used by physiotherapists in critical care have rarely been appropriately questioned or evaluated [1, 2]. The limited diagnostic accuracy of lung auscultation and the portable chest radiograph in the critically-ill [3-5], questions what we as physiotherapists have been presumably “treating” and thus provides challenges and opportunities that physiotherapists must address. Conditions such as acute lobar collapse should respond to chest physiotherapy including patient re-positioning with collapsed lobe uppermost, airway suctioning and manual lung hyperinflation [6, 7]. However, how often do physiotherapists use MHI  in this age of lung protective ventilation ? In addition, as the portable chest radiograph is generally used for both the detection and monitoring of patient outcome , with its limited diagnostic accuracy, it is unclear what conditions were truly being investigated (e.g. how many patients actually had pleural effusions?). The routine daily chest radiograph may no longer the norm for intensive care, with on-demand imaging becoming a more common strategy . Unless the pathology in question, such as lobar collapse, causes clinical deterioration (e.g. arterial desaturation) then a chest radiograph may not be ordered and hence be un-detected. In addition, the portable chest radiograph has often been taken a significant period before (e.g. 24-48 hours) the clinician’s intervention. The more important issue is the reduced diagnostic accuracy of the portable chest radiograph compared to real time lung ultrasound for the detection of common lung pathology such as lung collapse, consolidation, pleural effusion or pneumothorax . This questions the findings of these previous landmark trials and current critical care physiotherapy recommendations [6, 7]. 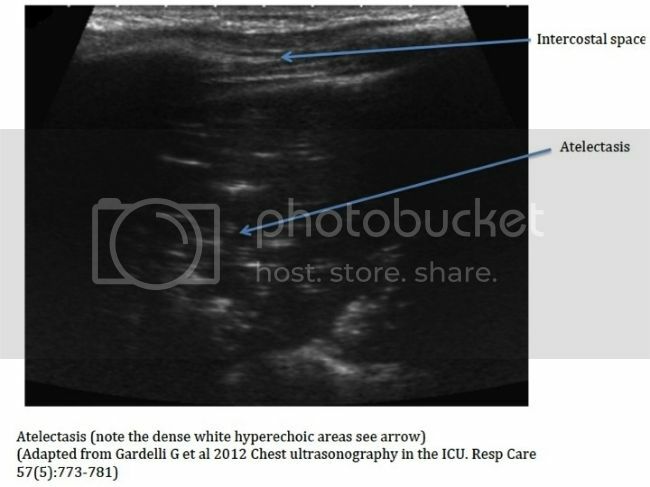 Thoracic ultrasound is an evolving diagnostic tool in critical care (see images with examples of pathology seen in critical care, adapted from the reference ), with huge potential for physiotherapists, with the increasing evidence-base for its excellent diagnostic accuracy and real-time monitoring capabilities [14, 15]. Diagnostic thoracic ultrasound is also useful for the evaluation of diaphragmatic function and mechanical ventilation weaning suitability . However, as diagnostic thoracic ultrasound is yet to be adopted by physiotherapists within critical care [17-19], there are a few challenges ahead. Current international recommendations for diagnostic thoracic ultrasound as a point care tool, advocate a combination of theory training with mentored bedside training . I had been based at Guy’s and St Thomas’ Hospital in London for around 4 years (since 2002) working in a large 30-bed critical care unit as part of a team of 6 physiotherapist’s. There was an opportunity for me to develop an extended scope of practice in the ICU with the previous physiotherapist in my role having explored the use of therapeutic bronchoscopy. I had thought about the pros and cons of the addition of a bronchoscopy skill in the remit of physiotherapy, aware that there were other physiotherapists in the UK with this skill. However, I had decided that the skill of bronchoscopy within the unit would have had a risk of being more a “technician” as part of the medical team, rather than it being a part of the physiotherapists interventions. I was more aware that physiotherapy needed to expand the diagnostic skill base within critical care and had heard of the expanding use of thoracic ultrasound within ICU. Fortuitously within our ICU there were portable ultrasound units already available that were primarily used by the medical team for invasive line placements and cardiac echo. I explored the potential training opportunities in the UK and undertook a one-day ultrasound course in Teeside designed for respiratory physicians in 2006, being the only physiotherapist amongst the respiratory and ICU physicians. The development of my own diagnostic thoracic ultrasound skills at Guy’s and St Thomas’ ICU (London, UK) entailed a combination of theory and practical instruction initially at a one-day course designed for respiratory physicians (http://www.nes.scot.nhs.uk/media/2124989/flyer_-_chest_ultrasound_-_october_2013_final.pdf). This was followed up by mentored training (once weekly sessions for 30 minutes-one hour with a consultant radiologist over approximately a 6-month period) utilising the guidance for practice and clinical governance through an adaptation of documentation developed by the Royal College of Radiology (http://www.rcr.ac.uk/docs/radiology/pdf/BFCR(12)17_ultrasound_training.pdf). Similar thoracic ultrasound courses are available in Australia e.g. http://www.aiu.edu.au). I incorporated thoracic ultrasound assessments routinely through the normal work-day, either initiated by myself or at the request of one of my physiotherapy team or intensive care medical consultants. Common outcomes as a result of the thoracic ultrasounds included new unknown diagnoses (detection of diaphragmatic dysfunction, potential pneumothorax, significant pleural effusions), sizing of pleural effusions (to determine potential need to intervention or just monitoring based on on-going management), and responses to physiotherapy interventions such as patient re-positioning, lung hyperinflation. Often only 5-10 minutes would be required for a basic patient screening with thoracic ultrasound, if the purpose was to more accurately diagnose the infiltrates present on the chest radiograph. My GSTT physiotherapy colleagues presented the preliminary findings of a subset of my imaged patients on the potential impact of diagnostic lung ultrasound on chest physiotherapy interventions: “Does the addition of diagnostic lung ultrasound impact on chest physiotherapy intervention in critically-ill patients?” at the 27th Annual Congress of European Society of Intensive Care Medicine meeting in Barcelona Spain, also published in Intensive Care Medicine 2014 40: Suppl 1:746. Beyond the potential for diagnostic thoracic ultrasound to discern whether chest physiotherapy is indicated, it was also of use to non-invasively assess the effect of the intervention, such a manual or ventilator hyperinflation to recruit collapsed lung , rather than repeated exposures to radiation with CXR’s. The utilisation of more accurate and easily repeatable investigations such as diagnostic thoracic ultrasound should assist to further develop the evidence-base for respiratory care by critical care physiotherapists. The challenge we face is to try to incorporate new potentially more accurate and appropriate diagnostic tools into our clinical and research practice. With the current issues around the role of physiotherapy within critical care (e.g. 24/7 access, respiratory versus rehabilitation focus, limited physiotherapy staffing to patient ratios, skill-mix), it will be a challenge for our clinicians to feasibly incorporate another diagnostic tool with busy clinical caseloads. However, with diagnostic thoracic ultrasound, we have the potential now for the more accurate diagnoses of conditions such as lung collapse/consolidation (as distinct from pleural effusions), that will enable more appropriate delivery of interventions and monitoring the response to therapy. Such tools will also enable us to determine of the prevalence of acute pulmonary conditions and an understanding of their potential impact on patient outcome, in addition to the role of physiotherapy. This should expand our understanding of the pulmonary conditions that may optimally managed through physiotherapy and hence question some of the current evidence-based recommendations . 1. Hanekom SD, Faure M, Coetzee A: Outcomes research in the ICU: an aid in defining the role of physiotherapy. Physiotherapy theory and practice 2007, 23(3):125-135. 2. Gosselink R, Bott J, Johnson M, Dean E, Nava S, Norrenberg M, Schonhofer B, Stiller K, van de Leur H, Vincent JL: Physiotherapy for adult patients with critical illness: recommendations of the European Respiratory Society and European Society of Intensive Care Medicine Task Force on Physiotherapy for Critically Ill Patients. Intensive care medicine 2008, 34(7):1188-1199. 3. Xirouchaki N, Kondili E, Prinianakis G, Malliotakis P, Georgopoulos D: Impact of lung ultrasound on clinical decision making in critically ill patients. Intensive care medicine 2014, 40(1):57-65. 4. Agricola E, Arbelot C, Blaivas M, Bouhemad B, Copetti R, Dean A, Dulchavsky S, Elbarbary M, Gargani L, Hoppmann R et al: Ultrasound performs better than radiographs. Thorax 2011, 66(9):828-829; author reply 829. 5. Lichtenstein D, Goldstein I, Mourgeon E, Cluzel P, Grenier P, Rouby JJ: Comparative diagnostic performances of auscultation, chest radiography, and lung ultrasonography in acute respiratory distress syndrome. Anesthesiology 2004, 100(1):9-15. 6. Stiller K JS, Grant R, Geale T, Taylor J, Hall B . : Acute lobar atelectasis: a comparison of five physiotherapy regimens. Physio Theory and Practice 1996, 12:197-209. 7. Stiller K: Physiotherapy in intensive care: an updated systematic review. Chest 2013, 144(3):825-847. 8. Skinner EH, Haines KJ, Berney S, Warrillow S, Harrold M, Denehy L: Usual Care Physiotherapy During Acute Hospitalization in Subjects Admitted to the ICU: An Observational Cohort Study. Respiratory care 2015, 60(10):1476-1485. 9. Neto AS, Simonis FD, Barbas CS, Biehl M, Determann RM, Elmer J, Friedman G, Gajic O, Goldstein JN, Linko R et al: Lung-Protective Ventilation With Low Tidal Volumes and the Occurrence of Pulmonary Complications in Patients Without Acute Respiratory Distress Syndrome: A Systematic Review and Individual Patient Data Analysis. Critical care medicine 2015, 43(10):2155-2163. 10. Stiller K, Geake T, Taylor J, Grant R, Hall B: Acute lobar atelectasis. A comparison of two chest physiotherapy regimens. Chest 1990, 98(6):1336-1340. 11. Lakhal K, Serveaux-Delous M, Lefrant JY, Capdevila X, Jaber S, AzuRea network for the RadioDay study g: Chest radiographs in 104 French ICUs: current prescription strategies and clinical value (the RadioDay study). Intensive care medicine 2012, 38(11):1787-1799. 12. 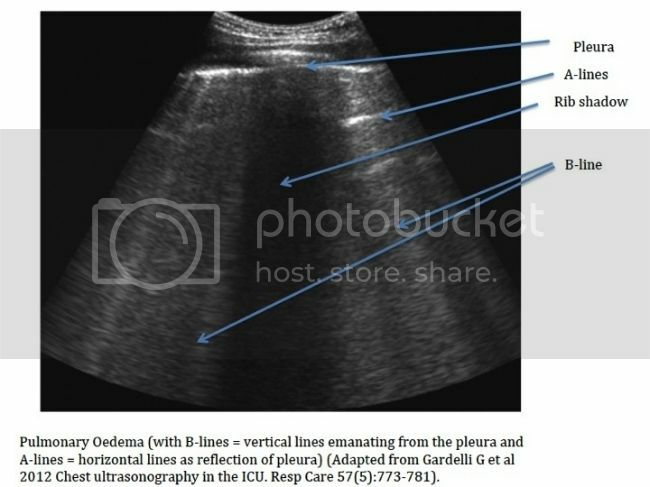 Xirouchaki N, Magkanas E, Vaporidi K, Kondili E, Plataki M, Patrianakos A, Akoumianaki E, Georgopoulos D: Lung ultrasound in critically ill patients: comparison with bedside chest radiography. Intensive care medicine 2011, 37(9):1488-1493. 13. Gardelli G, Feletti F, Nanni A, Mughetti M, Piraccini A, Zompatori M: Chest ultrasonography in the ICU. Respiratory care 2012, 57(5):773-781. 14. Via G, Storti E, Gulati G, Neri L, Mojoli F, Braschi A: Lung ultrasound in the ICU: from diagnostic instrument to respiratory monitoring tool. Minerva anestesiologica 2012, 78(11):1282-1296. 15. Volpicelli G, Elbarbary M, Blaivas M, Lichtenstein DA, Mathis G, Kirkpatrick AW, Melniker L, Gargani L, Noble VE, Via G et al: International evidence-based recommendations for point-of-care lung ultrasound. Intensive care medicine 2012, 38(4):577-591. 16. Zambon M, Cabrini L, Beccaria P, Zangrillo A, Colombo S: Ultrasound in critically ill patients: focus on diaphragm. Intensive care medicine 2013, 39(5):986. 17. Ntoumenopoulos G, Hough J: Diagnostic thoracic ultrasound within critical care. Journal of physiotherapy 2014, 60(2):112. 18. Le Neindre A, Mongodi S, Philippart F, Bouhemad B: Thoracic ultrasound: Potential new tool for physiotherapists in respiratory management. A narrative review. Journal of critical care 2016, 31(1):101-109. 19. Leech M, Bissett B, Kot M, Ntoumenopoulos G: Lung Ultrasound for Critical Care Physiotherapists: A Narrative Review. Physiotherapy research international : the journal for researchers and clinicians in physical therapy 2014. 20. 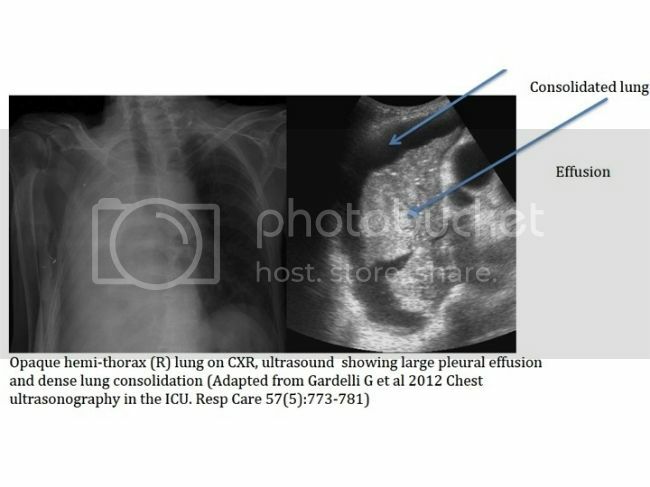 Cavaliere F, Biasucci D, Costa R, Soave M, Addabbo G, Proietti R: Chest ultrasounds to guide manual reexpansion of a postoperative pulmonary atelectasis: a case report. Minerva anestesiologica 2011, 77(7):750-753.